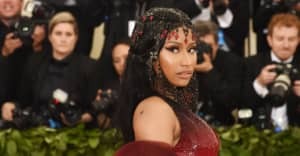 Tonight's VMA Awards ceremony is taking place at Radio City Hall in New York City, but for Nicki Minaj's performance, the show took things downtown to the World Trade Center's Oculus center. In a segment that was prerecorded earlier this weekend, Nicki performed a medley of tracks off her new album Queen. She kicked things off with "Majesty," sans Eminem and Labrinth. She then performed "Barbie Dreams," and finished the medley off with "FEFE," her collaboration with 6ix9ine. Although the latter initially didn't appear on her new album Queen, she tacked it onto the tracklist last week. Earlier in the night, Nicki won the Best Rap VMA for "Chun-Li."